This photo shows the corridor side of the coach, with the distinctive high windows. That below shows the compartment side. On its normal duties, this set ran with a Pullman Third between the two Composite coaches, which were marshalled with their first-class sections towards the adjacent brake vehicle. Displaced by the electrification of the West Sussex line to Littlehampton in 1937, set 195 is known to have worked (now minus Pullman car!) with sister 4-car set 194 in Newhaven boat trains in 1939. Composite 5645 was removed in 1943 and set 195 consequently reduced to 3-cars. In June 1947 this set was a 3-car set "B", booked to work between London and East Grinstead, Tunbridge Wells West, Brighton, Lewes and Eastbourne. In June 1957, set 195 was expanded to 9 cars and renumbered 455. However, in 1958 the 3-cars from former set 195 were removed from set 455 and replaced by other vehicles. Set 195 was reformed as previously by June 1959 and continued working on duties in East Sussex until withdrawn in September 1961. This coach was used, after withdrawal, as the staff coach for the Chipmans Chemicals' weed-killing train. The train was based in Horsham, but was to be seen working over all the lines in the South of England. As such 5644 (now CWT 8) retained a certain amount of its interior, including most of the internal partitions and some panelling and seats. On arrival at the Bluebell for preservation it had been thought to have a very sound body structure, and as such was an early candidate for reconstruction. To help preserve it, the roof was covered in roofing felt by a visiting scout group. Unfortunately it was found that its previous roof covering had cracked, letting water in and then trapping it. The south end of the coach appears in good condition, but there is extensive rot affecting much of the north end and one compartment in the centre of the coach. 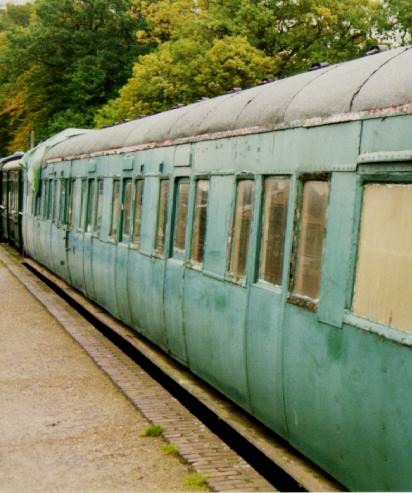 As the only surviving steam-hauled non-brake side corridor restriction 4 Maunsell to survive, it is considered one of the more important Maunsell coaches in the Bluebell's collection, and remains a strong candidate for full restoration. This book may be available new from the Bluebell Railway's Shop or, for a used or older edition, try The Carriage Shop at Horsted Keynes on your next visit. © Copyright April 1995 by Richard Salmon and January 2007 by Martin Skrzetuszewski.